3.2kW Heat Output. Wick Double Burner Highly Efficient.CE & NF Approved. LCLEAN COMBUSTION: TOYOTOMI's state of the art Double Clean® Chamber System maximizes fuel combustion and reduces unwanted emission gases to ultimate safety level. HIGH EFFICIENCY: The TOYOTOMI heater has 99.99% heat efficiency with Infra-red-ray heating. 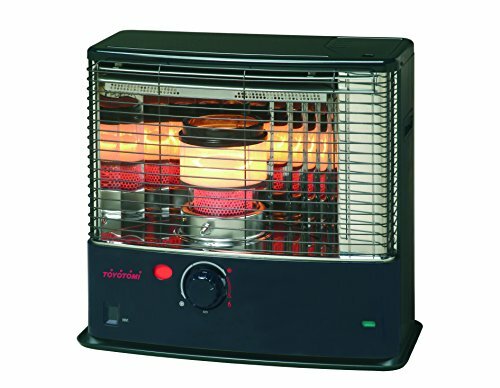 NO INSTALLATION: This heater can be installed without wires and without exhaust pipes. This makes it a very convenient heating source. AUTOMATIC IGNITION: The heater is easy to operate, simply by turning the main dial to the right and push the igniter button, activating the 'pumpa' piezo element. TRIPLE SAFETY EXTINGUISHER: There are 3 extinguishing methods on the RC-320 1. By retracting the wick. 2. By pushing emergency button. 3. Automatic shut-off is activated when the heater is bumped into, or in the event of a tip-over (earthquake safety device). AIR QUALITY CONTROL SYSTEM (E-GUARD): This heater is equipped with a E-Guard air quality control system. The customer is informed when additional ventilation is desired. The heater will be switched off when the room is not ventilated sufficiently. COOL-TOP PLATE WITH REDUCED TEMPERATURE POWERFUL HEATING OUTPUT: It offers intense heating output up to 10,900 BTU / h or 3.20 kW and by adjusting flame height you can reach a minimum mode of 2.89 kW. WICK LIFE EXTENDER: TOYOTOMI's original patented design. It helps maintain good wick performance and extends useful wick life. ECONOMICAL: Easy to ignite and low running cost with less fuel. EASY TO FILL / ANTI LEAKAGE VALVE: Convenient removable fuel tank and a handy syphon comes with the heater. The fuel tank is equipped with a anti-leakage valve which prevents leakage even when the tank is held upside down without the tank cap.